as we are and not be questioned. This week was a little up ended due to another home renovation project that required me to be out of the house for 3 nights. When polyurethane staining is done on the floors, evacuation is necessary! I was lucky enough to stay at my friend Emily’s house right here in town. Emily’s is the place to go when the power goes out (they have a generator) or if you are in need of a good meal. She and her husband are outrageous cooks and one is guaranteed to eat something that is always unique and delicious. Although we live just minutes from each other, her neighborhood is somewhat different from mine. She lives in the town’s center with lots of sidewalks, the town green (complete with bandstand) and with shops-including Starbucks- within walking distance. The houses, like mine, are older. But unlike mine, they are closer together. Her home is warm and welcoming and a reflection of her family. In fact, as a guest, you immediately find yourself immersed in the comfort of their abode. I was blessed with a space of my own, a comfortable pullout couch (seriously!) and a full bath in the basement. For those of you who follow me, you may remember my reflection on home renovations from August (Renovation, Reclamation, Rebirth), where I talked of the significance of my first independent home improvement project. (And if you haven’t read it, check it out! It may help you understand this particular musing!) Anyway, this recent project involved more than just staining hardwood floors. My staircase leading to the second floor of my home was finally repaired, redone and realigned after a decade of being incomplete. Like many projects, my former husband began the renovation with excitement and enthusiasm only to quickly lose interest to other repairs or distractions that seemed more exciting. His lack of commitment to the project became a metaphor for the deterioration of our relationship. For years, the stairs became the reason I was ashamed to have people over to the house and I even hesitated to open the front door because I was so embarrassed by its appearance. For the first part of their childhood, the boys always hung their Christmas stockings from the ballisters. But when the area under went its destruction, we could no longer uphold that tradition. Instead, they laid them on the open stairs and every Christmas Eve I hoped that the goodies wouldn’t fall through the open parts and be lost. Until very recently, I did not have the financial means to undertake such an extensive repair. But I am blessed to have a contractor who not only understands my situation but has the respect and professional ethics to get the job done. He knows that the repair was not only a safety issue but a spiritual and healing one as well. To say that he attended to every detail would be an understatement. When problems arose (as they always do with home repair), he called in a finish carpenter to help. He also discovered that all the bedroom door frames were askew and that the beautiful red oak wood was cracked and dried out from years of not being finished. As the project got underway, each day became a celebration for the three of us as we watched the heart of our home become more whole. I am excited to begin the next step towards completing the rebirth of my home. Within a month we will start painting the living and study area walls and ceiling. 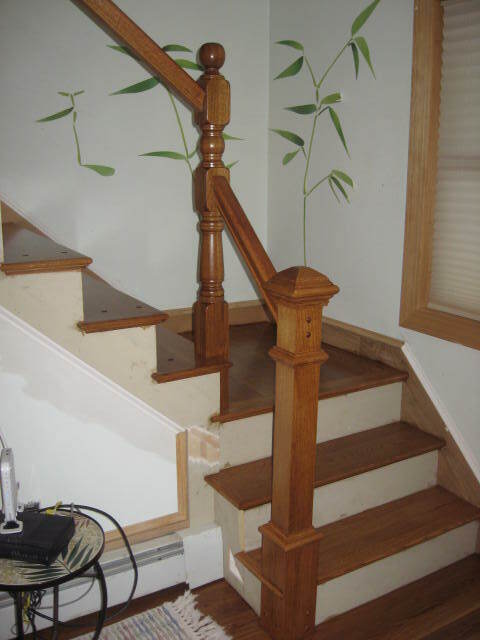 We will continue with the new color scheme throughout the front hall, stair risers all the way to the second floor. The carpet in the former areas will be ripped out to reveal beautiful maple wood floors. The big oak desk that I needed for graduate school will be donated, creating more space for us. This home repair has definitely filled me with a sense of pride. I am glad that I can show my sons a concrete example of what it means to create a healthy loving space for friends and family (just like Emily). I am thrilled that I created this legacy for them. I am certain that they will pass it on. and afterwards, our dwellings shape us.